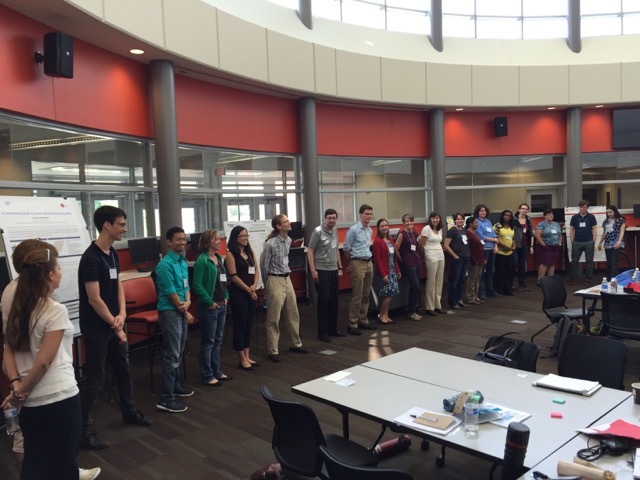 ICER 2015 at the University of Nebraska, Omaha was fantastic. Brian Dorn did a terrific job hosting all of us. The Doctoral Consortium went really well. We had 20 students from US, Chile, Germany, and UK. Below is a picture from the “Up against the wall bubble sort” where experienced students went to one side, and newer students went to the other, and the former gave advice to the latter. Georgia Tech had even more going on at ICER and RESPECT than I mentioned in my earlier blog posts (like here and here). The GVU Center did a nice write up about all of us here. The biggest thrill at ICER for the GT crowd was Briana Morrison receiving the Chairs Award (one of two best paper awards at ICER) for the paper that I blogged about here. Below is the whole GT contingent at ICER (including chair Brian Dorn, GT alum). The other best paper award, the peoples’ choice John Henry Award, went to Kristin Searle and Yasmin Kafai (see paper here) about the e-textiles work with American Indians that I blogged about here. Kristin had so many interesting insights, like the boys in her project telling her that “I don’t own” the projects they made because they felt no ownership over the programming environment they were using. The quality of the papers was very good (you can see the list of all of them here). My favorite paper from my review packet was presented Monday morning, Spatial Skills in Introductory Computer Programming. Steve Cooper and Sheryl Sorby with two undergraduates at Stanford did the study that I’ve been wanting to see for ages (see blog post where I talk about it). Training an experimental group in spatial skills improved performance over a control group. Surprisingly, SES and race differences disappeared in the experimental group! This is an important result. But one session blew me away — it changed how I think about blocks programming. 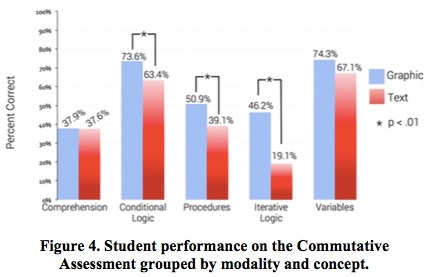 The first paper was from Thomas Price and Tiffany Barnes showing that students using blocks were able to achieve programming tasks faster than those using text, but with no difference in learning or attitudes afterwards (paper here). This was an interesting result, but it was a limited study (short intervention, no pre-test) so it mostly supported a finding from Chris Hundhausen from years previous that graphical, direct-manipulation languages lead to faster start-up than text languages (see paper here). David Weintrop presented his remarkable paper with Uri Wilensky (see paper here). Below is the graph that changed my thinking about blocks. David carefully developed an isomorphic test in blocks and text, and gave it to the same population. Students did much better on the blocks-based test. MODALITY MATTERS! Blocks and text are not equivalent. He did careful analyses at each level of the test. For example, David replicated the result that else clauses in text are really hard for novices (which I talked about here), but students perform much better in blocks-based if-else. Diana Franklin presented their paper describing fourth graders reading Scratch programs (see paper here). I was expecting a paper on program comprehension — it wasn’t. Instead, it was a paper about user interfaces, and how the user interface interfered or supported students exploring and coming to understand the program. I came away from that three papers realizing that blocks programming is likely the best modality to use in elementary school programming, and perhaps even when starting to program in high school, and maybe even for end-user programmers. But even more important, I realized that Andy Ko’s comments about programming languages as being a powerful and unusable user interface (see his blog post here) is the critical insight about programming today. David showed us that blocks can dramatically increase readability of programs. Diana showed us that the user interface dramatically influences the readability of the blocks. At the novice programming level, blocks-based languages are the most promising direction today, and designing good blocks languages is as much a user interface design problem as it is a programming language design problem.